Ursula Giuliani was born of gentle folk of Mercatello in Urbino in 1660. When Ursula was four her mother took ill and on her deathbed, she consigned each of her children to one of the sacred wounds of Christ crucified. Veronica received Jesus' side pierced with a lance. Around this age, Ursula had a very irritable temperament, inclining to be very cranky and dictatorial. Ursula experienced at the age of seven her first mystical experience. "I remember that at the age of seven or eight years, Jesus appeared to me on two different occasions in Holy Week." It was from this time that Ursula practiced mortification freely and was attacked on many occasions by the Devil. It was on July 17, 1677 that Ursula was admitted as a Capuchiness postulant. On October 28, she received the habit and the name Veronica. During her religious life, she was frequently plagued by Satan. He pushed her down stairs, appeared as her Novice Mistress, and beat her severely. To this, Jesus showed his peculiar favor by appearing to her in many forms and many times. At times, she would fall to the ground, so wrapped up was she in mystical contemplation. Veronica held most offices in the Monastery during her life. She was Novice Mistress for twenty-two years. In 1716, she was appointed Abbess and remained so until her death. During her time as Abbess, Veronica proved herself, in practical matters, by building new dormitories on the Monastery and installing an elaborate water piping system. The last thirty-five years of her life were those years when she became totally immersed in Christ. God willed that she undergo terrible aridity. Satan coupled to this, binding her in chains striking her and appearing as savage animals in her cell. It was at this time that Jesus transferred his crown of thorns to her head. This was to be completed later by the transfer of all His wounds. Veronica underwent continuous scrutiny from doctors and examiners which added more to her constant agony. It was on July 9, 1727 that Veronica passed away. To her vow of obedience, she was so devoted that she required a ministerial permission to die. Her death was directly or indirectly due to the stroke which she suffered on June 6. 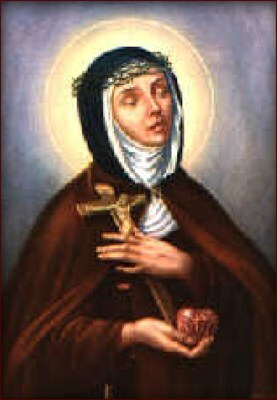 She was canonized on May 26, 1839 and her feast is celebrated on July 9.